From authentic products imported from Mexico, to Tex-Mex favorites made in the U.S.A., our brands bring delicious Latin flavors to families across America. Intermex Products is the sole distributor for two well-known Mexican brands: La Torre and La Mexicanita. We also own J.R. Texas, a local brand of canned beans, sauces and chili made in our Texas plant. If you’d like to learn more about our products and pricing, or you are interested in stocking our items in your stores, let us know. This authentic brand from Mexico has been enjoyed by Latino families for more than 50 years – and now, it’s available in the U.S., from our retail partners. Fans of the famous brand love its sweet and savory products, including traditional Mexican cookies and pastries, crackers, chili, refried beans, and enchilada sauce. Our La Torre cookies are available in display-ready pallets with customizable product mixes. Tempt your customers with a taste of home, by offering Malvavisco sandwich cookies, colorful Grageas, or marshmallow-topped Copitos. 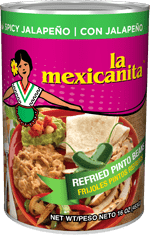 We also offer display-ready pallets of Tostas crackers, and mix-and-match refried bean assortments, with choice of Refried Pinto Traditional, Refried Pinto Vegetarian, Refried Black Beans and more. Find out how you can stock La Torre products in your store. La Torre is one of the biggest suppliers of Mexican products to the food service industry. If you are looking for the best tasting crunchy Jalapeño Peppers, Chipotle Peppers, Whole or Crushed Tomatillos, Roasted Green Chiles, Roasted Red Bell Peppers and more, contact us today! This popular Mexican brand is carried in supermarkets across Mexico and the United States. As the sole U.S. distributor, we are proud to bring the widely recognized label to American shelves. La Mexicanita is known for its quality products, offered at an exceptional value. Contact us today to learn more, and stock La Mexicanita products in your store.